Hot news here as a call to Moran Yacht & Ship brings confirmation that they acted for the buyer in this week's sale of the 45.7m motor yacht Vantage. 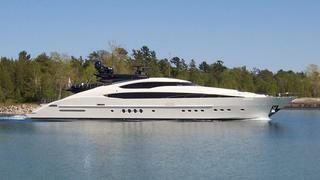 Launched in May 2010, Vantage is the 7th yacht in Palmer Johnson’s popular 150' Super Sport Yacht Series. Known for their colourful hulls, this latest 150 has an elegant cream-coloured hull with an anthracite trim. The masculine interior is a combination of chocolate browns, creams, and blues with frabrics from Aura, Nicotrend, and Rubelli, and features interior bulkheads and soles of rustic bleached teak with deep navy dyed high gloss Zebrano accents and passage door inserts of Wenge tiles.